Plant researchers have developed an online application that predicts how crop growth is affected by photosynthetic changes at the molecular, cellular or leaf level of plants. Food production depends on photosynthesis, the process by which plants capture sunlight and convert it into plant growth, biomass and grain. In the next decades, the world population is expected to reach 9.5 billion and food demand will increase significantly, so improving photosynthesis has become a global research priority. “Enhancing photosynthesis has the potential to increase crop yields, but the link between photosynthesis and crop productivity is not straightforward because it crosses multiple scales of biological organisation. We created modelling tools that help us navigate through these complexities to identify targets that have the greatest impact on crop yield,” says Dr Alex Wu, a researcher with the ARC Centre of Excellence for Translational Photosynthesis (CoETP) at the University of Queensland. This online “crystal ball” of crop growth, a small part of the cross-scale model, is designed to show researchers what would happen to a crop canopy with changes in photosynthesis under variable environmental and canopy conditions such as radiation, temperature, levels of CO2, canopy size and amount of nitrogen in leaves. 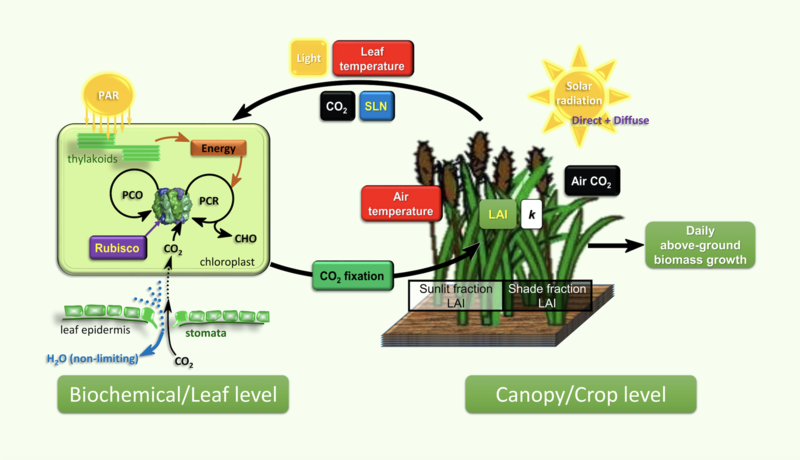 “Developing simulation tools like these, we are working towards connecting lab-based research and discoveries, at the leaf or molecular level, with crop productivity under variable environmental conditions,” Dr Wu said. ARC CoETP Chief Investigator Professor Graeme Hammer says that researchers could now use the online application and see how their work is having an impact on crops in the field, which will radically accelerate the discovery process. “They can also incorporate high temperature or high CO2 conditions to test effects of climate change,” he said. The Diurnal Canopy Photosynthesis Simulator (DCaPS) online application, calculates diurnal (period from sunrise to sunset) canopy CO2 assimilation and daily biomass increment for a crop under well-watered conditions. DCaPS is now publicly available at www.dcaps.net.au. This study was published recently in the journal Functional Plant Biology and was funded by the Australian Research Council (ARC) Centre of Excellence for Translational Photosynthesis and the Queensland Alliance for Agriculture and Food Innovation (QAFFI) at the University of Queensland. Article appeared in “Leaflet” Newsletter of the CoE.